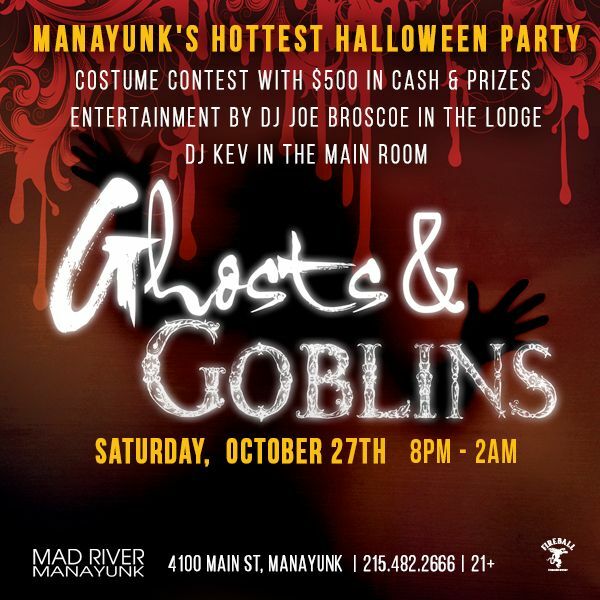 Ghosts & Goblins is back at Mad River Manayunk for it's 11th year running! This is Manayunk's biggest and hottest halloween party - do not miss out because last year sold out days in advance! Come dressed in your greatest costumes and compete for cash and prizes! Come early for the open bar (for our VIP ticket holders only - advance purchase required for VIP) and enjoy great drink specials while the DJ spins dance music in every room of Mad River for a howling good time!! Get there early - STAY LATE! This is going to be one VERY FUN NIGHT!! Invite your friends above using the "LIKE" & "SHARE" buttons above. Mad River Manayunk features a beautiful main room, complete with fireplace and 10 booths large enough to fit all of your friends. With flatscreen televisions in each booth, and more plasmas than can be counted, Mad River is the only place to watch your favorite college and professional sports. In addition to the large main room, Mad River also features The Lodge, sure to be Manayunk's favorite private party room. Known for it's high energy, fun music, and welcoming staff, Mad River is Manayunk's go to destination. Whether you are planning a party with your friends, watching the game, or just going out for dinner and drinks, Mad River is the place for you!